The solution is simple to show the recycle bin icon on the windows 10 Desktop, for example if you have accidentally deleted the trash symbol (recycle-icon) from the Desktop. 1.) ... Show the Recycle Bin on Windows Desktop! 2.) ... Create the shortcut to the Recycle Bin ergo TrashCan! 3.) ... Open the Recycle Bin about Windows 10 Run Dialog! 4.) 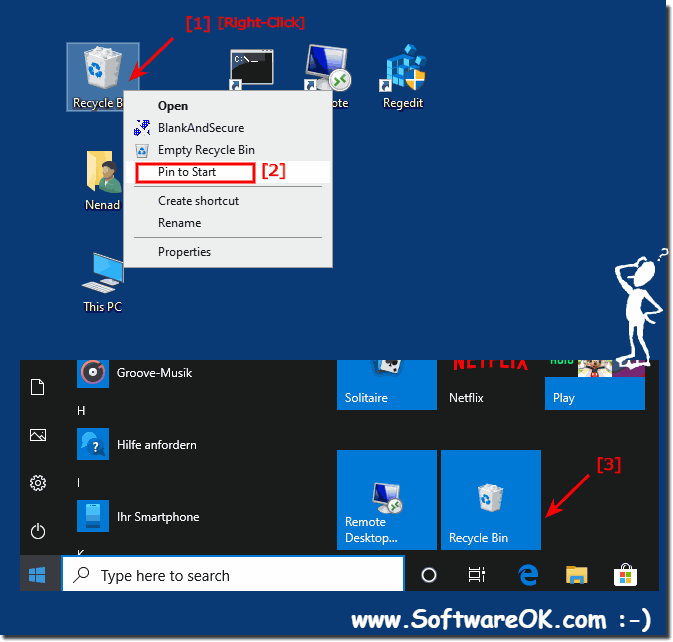 ... Pin the Recycle Bin (Trash Can) on Windows 10 Start! 1.) Show the Recycle Bin on Windows Desktop! If you want to see the Recycle Bin on the Windows 10 Desktop please right-click on the free space on the Desktop and select Personalze. Click the text "Change desktop icons", in "Desktop Icon Settings" set the check for "Recycle Bin" or remove the check from the "Recycle Bin" box, if you want to hide the "Recycle Bin" on the Windows-10 Desktop! 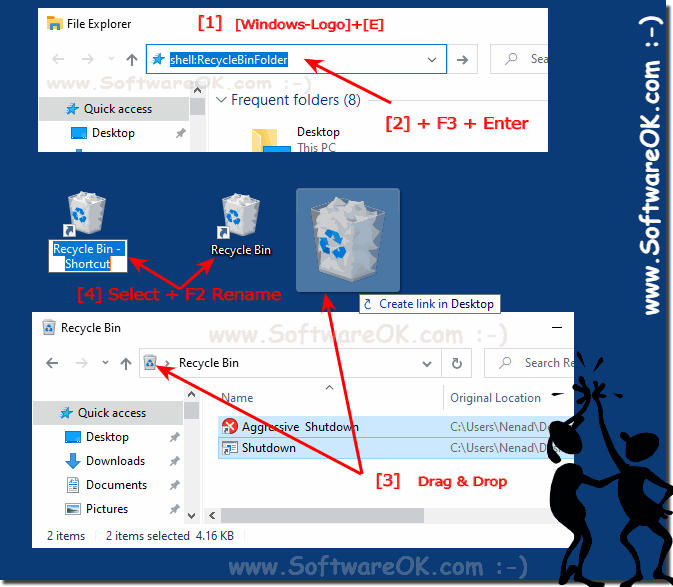 (Image-1) Show Recycle Bin on Windows 10 Desktop! 2.) Create the shortcut to the Recycle Bin ergo TrashCan! And now do a Drag and Drop action from Address-Bar to the Desktop. 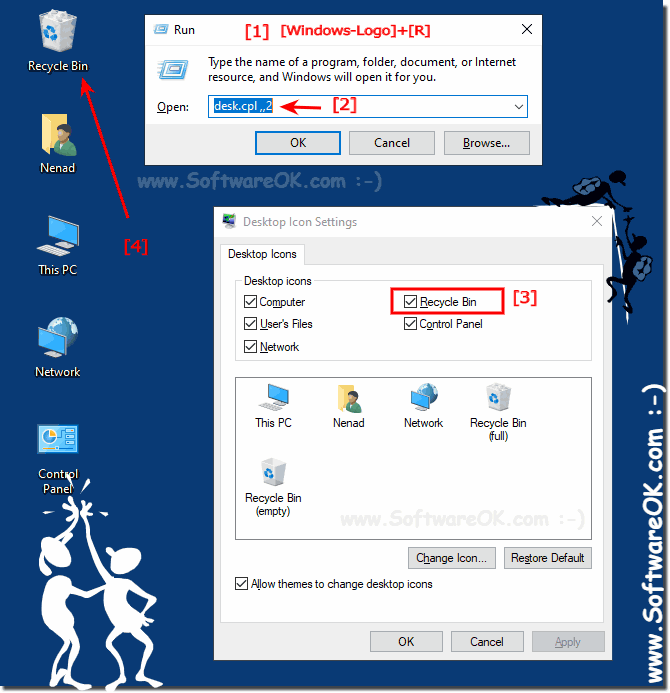 (Image-2) Recycle Bin ergo TrashCan Shortcut! 3.) Open the Recycle Bin about Windows 10 Run Dialog! (Image-3) Recycle Bin over the windows 10 Run-Command! 4.) Pin the Recycle Bin (Trash Can) on Windows 10 Start! If you have ... Create the shortcut to the Recycle Bin ergo TrashCan! do a right click on pin to Start! To pin to start is a good Solution for Microsoft Surface Pro and Go in Tablet Mode for a easy access when you tap on the Touchscreen, the solution is very simple and is often used on other Desktop PCs on Monitors with Touch Supported Displays. 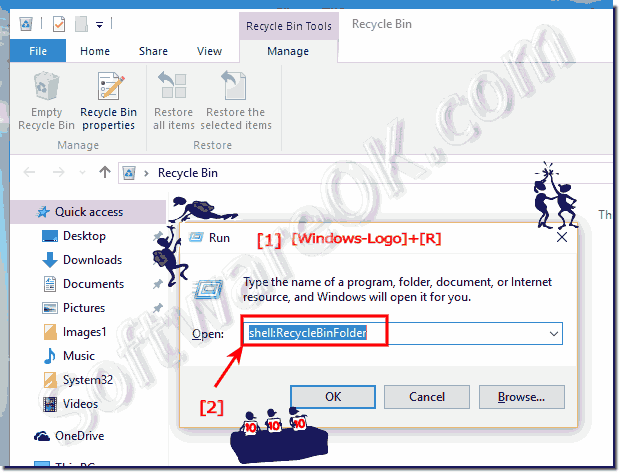 (Image-4) Recycle bin in windows 10 Start! Final thoughts about the trash! As you can see from desktop images created in Windows 10 above, there are several ways to enable quick access to the Windows 10 recycle bin. You can use these examples to find the optimal solution for you and use it as a personal solution to open the trash quickly without having to search depending on whether you use the trash on the PC with a keyboard or Mobile on the Tablet PC or Surface Pro / Go where you then like to clean the trash occasionally on the touch screen without a keyboard. It really makes sense to take some time to start or clean up the recycle bin faster. The Recycle Bin is a simple yet effective tool that is often used under Windows to restore files after deletion. The possibilities were tested on various MS OS and successfully verified. Tip: ► Trash contents can be completely shredded! Windows-10 - FAQ-22: Is there a recycle bin for the windows 10 Desktop (show, hide)? The solution is simple to hide the switch user at login screen on Windows-10, or enable / disable / remove from Login Screen Content / Solution / Tip: 1.